We are pleased to introduce the New Bernina Series 5 range of sewing machines. The new machines have sewing and embroidery capabilities and come with the BERNINA Hook, a Jumbo Bobbin with 70 percent extra thread capacity, 8.5″ free arm space right of the needle, an Automatic Thread Cutter, and a 4.3″ touchscreen that is easy to navigate. The 5 Series machines come standard with a Magnetic Accessory Box, a Semi-automatic needle threader, the BERNINA Adaptive Thread Tension, and 2 spool holders. 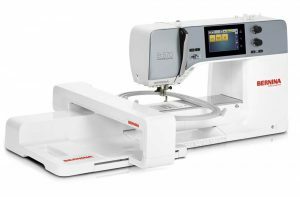 BERNINA 5 Series machines are now available at Otto & Penny’s Sewing Centre.